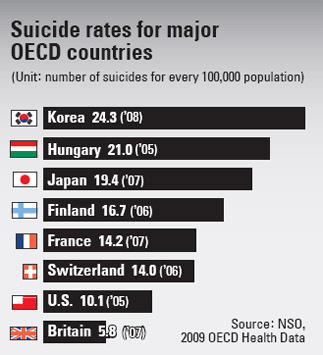 The recent string of suicides at the Korea Advanced Institute of Science and Technology (KAIST) provides South Korea with the opportunity to discuss the larger problem of suicide here—according to 2008 numbers approximately 35 people commit suicide a day. The total is well over 10,000 a year putting Korea in first place among the OECD and nearly double the average. 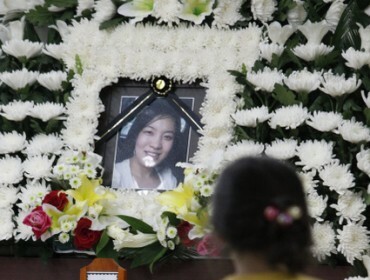 When added up over the last ten years, Korea has lost some 100,000 of its people to this silent epidemic. Yet during my years here, I’ve heard little in the way of serious discussion about this killer. Normally someone’s suicide is given short shrift—done one day and swept away the next, an ethereal exit. Even when people of stature decide to end their own lives—former president Roh Moo-hyun, actress Choi Jin-shil, Lee Yoon-hyung (daughter of Samsung’s CEO, Lee Gun-hee)—, the event is ushered out the door as soon as possible. It’s almost as if the act itself is contagious—and it may be given the Werther effect—with the number of suicides rising following a high profile death. Surely KAIST is worried about this, especially its 75-year-old president and former MIT professor Suh Nam-pyo who instituted policies that critics have pounced on following the four student suicides in as many months. But what about the society? What about the many other suicides (more than 4000 if previous statistics still hold) that occurred in those four months? What about the lack of mental health infrastructure here? What about the fact that any type of admitted mental issue leads to a stigmatization (you’re either normal or mentally “ill”)? In what is surely one of the most stressed nations where school serves as constant pressure cooker with elementary kids hurrying off to hagwon as soon as school lets out for hours of studying, where after every test a ranking is posted on a kid’s forehead, where many high school kids stay in school from before 8 a.m. until after 10 p.m., where one’s university is one’s future, and where there aren’t any second chances, there really remain few outlets and treatments for stress, depression and suicidal thoughts. But, carry on, so the saying goes. 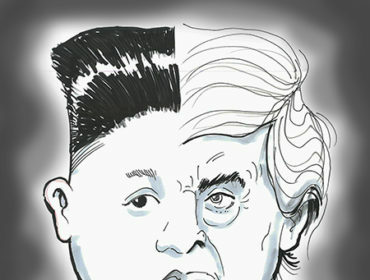 열심히해요. Work harder. Well someone(s) better start working harder to put in place education that encourages more cooperation and creativity —it is no wonder that a recent study showed that Korean kids have some of the worst social skills in the world—over insane memorization, passive learning and the you-are-a-loser-if-you’re-not-number-one philosophy. Furthermore, the government needs to get off its hands and establish policies that destigmatize depression and implement a better mental health system in all areas of society. The recent news that the Ministry of Education, Science and Technology will establish a committee in each elementary, middle and high school across the country to deal with potential suicides is a start. Now as KAIST enters it’s 40th year, what is the goal? Is it to go beyond “national” to international? That is what Suh seems to think bringing back his ideas from MIT. 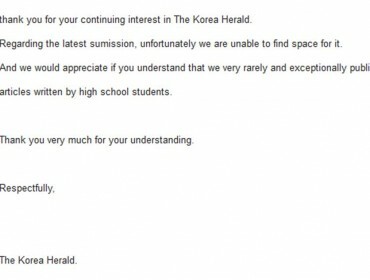 Do Koreans wish to be global engineers and scientists doing research and writing academic papers in English? Listening to a KAIST professor on the radio this morning, I was reminded that going “global” would require a university that attracts students from around the world (now about 5% of KAIST’s 8,000 students are foreign) and renowned professors. To paraphrase, Jeffrey White, a professor of KAIST’s School of Humanities and Social Science said that nearly 99% of all research materials, academic papers, dissertations, seminars, conventions and so forth are in English. Thus, if KAIST students wish to be a part of that world, then they need to learn the language. But the larger question looms: are they ready? As I sit here typing, that question is being answered by young Korean students at the international middle school in the building across from my office. They take math and science in English. But they suffer as they toil to ascertain complicated subjects in a foreign language much, I gather, as the student’s at Korea’s top science university suffer as they face complicated subjects in a foreign language. Something’s gotta give and it appears to have done so. Hopefully the conversation will now turn to the bigger demons in the room: ignorance of mental health, a hyper-competitive society where “losers” are labeled and ostracized, the I-am-defined-by-my-business-card mentality, the “work harder and everything will get better” marching orders that are handed out on a daily basis to the youth of Korea and the tacit agreement to sweep the issue of suicide under the rug. Read my article about suicide in the April 14 Korea Times.